I am happy to report that my herb garden has taken off. This year I finally gave in and decided that I would grow my own herbs instead of relying on store bought. I tried a herb garden once before I had kids and it didn't go well. Our yard didn't have enough sun light during the day and I was horrible about remembering to water. Luckily now that I am older I love gardening and have had great success. This year my oldest son and I decided that we would grow tomatoes and four types of herbs. They are doing very well so far and I am excited to be able to use foods from my garden in my cooking. Until my tomatoes are ready to eat I have still been using store bought, especially since we eat a lot of burgers. 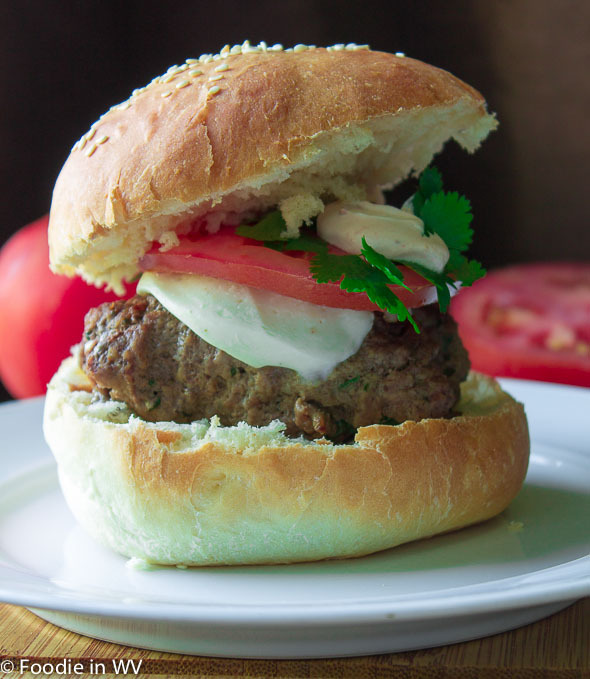 Last week I tried a new recipe for Spicy Chipotle Burgers from the June 2013 issue of Family Circle magazine. This recipe has 9 ingredients. It takes 25 minutes of total time, 15 minutes of which is active and makes 8 servings. I only made a few changes to the original recipe. First I made my own hamburger buns. Homemade buns have much better flavor and they are easier to make than you would think. Here are two links to the hamburger buns that I make 40 Minute Hamburger Buns and Homemade Sesame Buns. I used an indoor electric grill to make the burgers so my total grilling time was slightly longer than the recipe suggested. Finally I chose not to grill the buns. Since I use homemade buns and they are always baked the same day I don't see the need to grill my buns. My husband and I really enjoyed these burgers. They were one of the best burgers that I have eaten or made in a while. I really liked the chipotle sour cream, it was a great addition to the burger recipe and cooled down the spiciness of the burger. If you want to cut down on the amount of fat you could try using ground beef with a lower fat content. With 25 grams of protein this is a filling recipe that is also easy to prepare making it a perfect summer grilling option. I love chipotle flavors and would like to make these burgers, but I have to say that those hamburger buns look excellent! I love chipotle flavors also! The buns are so easy to make, which is great! Congrats about your garden - I wish I could grow one in my yard. Anyways, these burgers sound AWESOME! I am not sure if my kids would like them, but I definitely would! Hurrah for trying again, I'm glad the tomatoes and herbs are working out well. The burger looks tasty. I figured that maybe it would go better the second time around and so far it is working! I agree, it does save a lot of money! It gets really humid in the summer here so I have to soak my plants in the morning in order that they don't dry out. I hope your tomatoes turn out great! I love a good burger! The chipotle spicy combo makes this sound like a winner! That burger looks yum. Plus, homemade buns. You really Rock! Thanks for the sweet comments :) The buns are actually really easy and so much cheaper than store bought! Thanks :) The ones that I use the most often take a little bit of time, but they are worth it! Here is the link to the post I talked about the recipe, they are yummy!